Ice cream on the waterfront at Kaffee Eis. When Stuart worked at NZX we would meet there for an afternoon break. 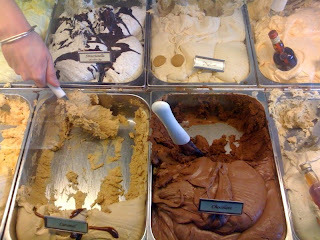 There is nowhere that has better ice cream or more interesting flavours: chai, ferrero rocher, passion fruit! I just wish they had more reliable opening times. This is not really my style of music, but I have to say that I am pretty impressed with the effort my nephew has made. He is the drummer, and filmed and edited the film with his friends. Another film maker in the family. Now that I finally managed to crack the net lock on my iPhone, allowing me to use it with any SIM card, I am starting to look at data plans here in New Zealand. . The iPhone really is deprived of most of its functionality if there is no access to non-wifi data, i.e. 3G. It was pretty straightforward in South Africa, where I had a pay-as-you-go card and just converted some of my minutes to data as needed. Returning to New Zealand I spent an hour perusing the confusing range of plans on the Vodaphone website - YouChoose, Base, Starter, iPhone - until I thought I knew what I wanted. 200MB for $40 seemed ok, and there was no minimum contract, which was important since I am leaving in January. So I call them and change the plan, all well and good. It's when I call tech support to get the access details to allow the phone onto the 3G network that I find out that iPhone data is not the same as normal data. Apparently I can't just use the normal data plan, I need an iPhone specific one. Whatever. But this one has a 24 months minimum running time, so I would have to pay to get out of it. So basically if you have a phone that can really use the data you pay for, you need to commit yourself for two years. I declined that offer, stuck with my vanilla data plan and so far I have had normal operations. So much for those sales tactics. I've now been back in Wellington for two days and slowly waking up from my zombified jetlag state, I notice that there has not been a bit of blue sky since my return. So, to cheer me up - and for the rest of you stuck in cold climes, here is a slideshow of all my best South Africa photos so far. Isn't it?! = Really? You don't say? Once I wanted to make a film about a day in the life of a labourer in Dubai. All around us where we lived on Sheikh Zayed Rd were new construction sites and every morning, lunch time and evening we saw endless groups of blue/green/orange-clad young men either appearing from dusty buses or waiting to board them to go back to wherever they spent their nights. It turned out to be impossibly difficult to make contact, find willing subjects or gain access to the sites and hostels where they live. Most documentaries I saw about Dubai mentioned the poor working and living conditions of imported labour on construction in the UAE, but even the BBC didn't seem to be able to get access to show real live footage. It makes me feel better that this injustice is finally being made visible. It's been a dry dry winter here according to those who have been here longer than I have, so everyone was very happy about the downpour we had last night. There as thunder and most impressive lightning (which I still don't know how to photograph, so you have to imagine great streaks of light across a purple sky with loud bangs of thunder following 330m/s later). We hoped that the rain would wash away some of the dust that has accumulated on the steps and the balcony, but this morning there was no sign of it having rained at all. No puddles, no mud, no washed concrete. I guess it's too hot, the rain just evaporates. 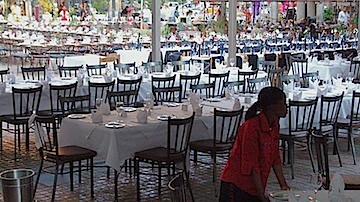 Last night, after two days of constructing stages and stetting tables outside, rigging lights and sound and removing cars from the road, the Long Long Table event took place here. It's a charity dinner for the Starfish foundation which looks after HIV/AIDS orphans, of whom there are far too many in this country. 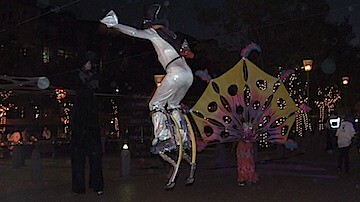 There were fire jugglers and stilt walkers and by all accounts everyone was thoroughly entertained and well fed. I can't wait till I get round to working out how to buy my (pre-paid) electricity and get the broadband set up. I'll let you know how that works out. Am I Back In Dubai? 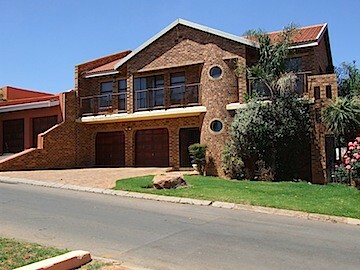 One of the posher parts of Soweto, Diepkloof has schools and quiet streets. The former men's and women's hostels are being replaced with family accommodation by the municipality. 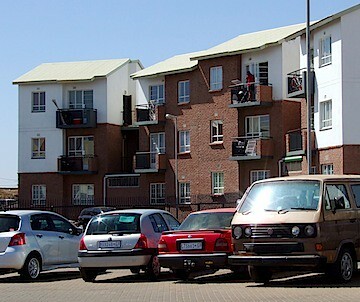 These flats near Freedom Square in Pimville are part of the renovation of Soweto. 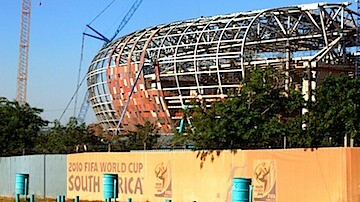 The renovation work for the 2010 World Cup is coming along. Johannesburg is getting 6 stadiums, two of which are in Soweto. 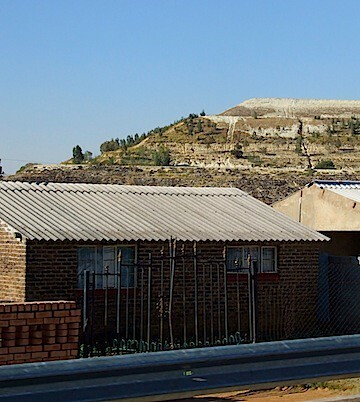 Some people still live without electricity or running water in the shadow of ginormous slag heaps left by the gold mines. You can see more Soweto photos here. All throughout my youth I had heard of Soweto, the South Western Township on the outskirts of Johannesburg, hotbed of ANC activity and location of frequent uprisings and clashes with the Apartheid regime. So I was pretty excited to finally be going to see it. I had heard all sorts of descriptions and been given advice, from the "you can't go on your own, you'll get mugged" to "why do you want to go, it's just a slum" to "you'll love it, it's such a hip and happening place". So thoroughly confused, I took a drive there with George, the father of a friend of a colleague of Stuart's. George is my first entrepreneur. He is 70 and retired from a job at a bank. He took a course with the Tourism Authority and now drives tourists through his home suburb. Apart from his in-depth knowledge of the area, having lived there since the 70's he also has some interesting stories about life under Apartheid and some pretty definite political views: "I don't give a man food, I give him the means to get his own food." I met my second entrepreneur (or rather both of them) as we were driving through Pimville, a small part of Southern Soweto. As we were driving along, I saw a large red elephant by the side of the road. It turns out that Lebo and Isaac had collected steel reinforcing rods, wire and red onion bags and were building a life-sized elephant. They had based it on a photo found in a magazine and drawn designs based on this to decide where the steel rods should go to form the base of the elephant. After covering the frame with onion sacks there were going to smooth it with cement to make a realistic-looking animal. These were then for sale. Pretty cool. If you want to buy one for your garden let me know and I'll give you their mobile number. I met my third entrepreneur at lunch. A cousin of George's (who seems to know everyone in the neighbourhood) Robby runs a B&B/restaurant/marketing firm. He co-ordinates with the large car companies such as Mercedes, Audi and Lexus to showcase their new models to potential buyers in Soweto. Despite it's large and increasingly well-off population and the building of many shopping malls in the last decade, Soweto still misses out on car showrooms. So Robby fills that gap by putting on a party and drawing in the customers. This court has been deciding such important human rights issues as the right of gay people to marry and adopt children; the duty of the government to provide pregnant mothers with retroviral drugs to prevent infection of their babies at birth; abolition of the death penalty... South Africa has the most modern constitution in the World, forbidding discrimination on the grounds of sexual orientation and disability, for example. All the justices of the first court inscribed their names into the concrete of the new building. 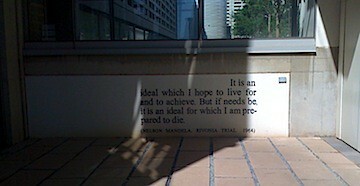 "It is an ideal which I hope to live for and achieve. But if need be, it is an ideal for which I am prepared to die." He then proceeded to spend 27 years in prison. 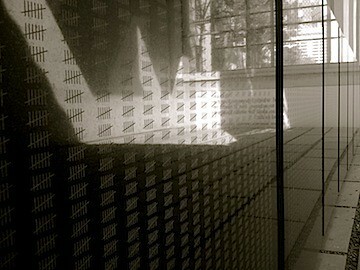 The days of his and other political prisoners' incarceration are marked on these slabs. 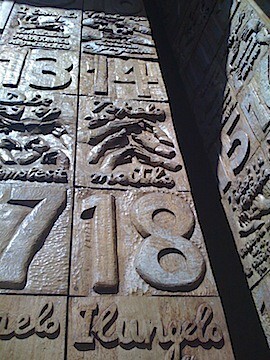 Each of the articles of the constitution is carved into the front door of the court, in all the official languages of South Africa, as well as Braille and sign language. This is the layout of the sheds built to deal with overcrowding at the women's prison. 4-6 non-White women would spend up to 23 hours a day in a cell built for 2. The inside of the women's prison. Prisoners were not allowed to cross the central space. It's an article about White wine titled "White Supermacy". Pretty close to the bone when found in the cafe inside the old prison. One of the projects helping to visualise the reality of the apartheid prison was to run workshops with returning prisoners to elicit their memories and capture the past. Everyday objects became meaningful when viewed through the decriptions of the ex-prisoners. This woman talked about the difficulty of opening cans brought in by visitors. Another spoke of being arrested because she forgot her passbook on the way to buying fish in the market. The complex housing the South African Constitutional Court is set next to and around the old prison, an architectural and political stroke of genius. Part of the site is the Old Fort, where White male prisoners were held, the women's prison for White and non-White female prisoners as well as Number 4, the prison for non-White male prisoners. A lot of effort was made to keep political prisoners apart from 'common criminals', non-Whites from White inmates, men from women, in case they realised that there really wasn't all that much difference between them. The whole complex is quite depressing with the tiny cells and sorry conditions prisoners were subjected to. Male prisoners crowded up to 70 in large rooms designed to sleep 30, sharing two toilets. Women shared tiny shacks between 4 or 6 when they were designed for two. Bedding allowances were different for White and Black prisoners, and they were fed different quality of food. Many Blacks were arrested for violating the pass laws, which required them to carry a registration book stating their entitlement to be in a certain area at a certain time, to carry out certain jobs and to live in specified areas. Between the 1940's and the 80's more than half of all non-White prisoners were pass offenders, or as one of the displays (under)stated: "Without meaning to, it was quite easy to break the law if you were Black". The only building that was completely knocked down to make way for the new court was the so-called Awaiting Trial Block, which once housed famous prisoners such as Nelson Mandela and Mahathma Ghandi. All that is left is a marked outline on the floor and the four staircases reaching up to the blue sky. One of those has been cleverly incorporated into the back of the court chamber, and the bricks gave been recycled to form the wall of the court and the Great African Steps. The design of the court is based on the traditional African concept of justice under a tree, where the chief would receive complaints and discuss matters of state I'm the village square on the shade of a tree. From the lamps to the carpet pattern to the shape of the windows this design is carried through. All over the hotel there are weird places to sit, apart from the 'feet in the pool' cafe I mentioned the other day. Not all are comfortable, but the black lounged built into the stairway is brill. You have to be sociable to sit there, though, as everyone stops to ask how it feels. My birthday was quite the success: I managed to scored lots of DVDs as well as some balloons and chocolates. Oh, and then there was the trip to the game lodge. More on that later. The toilet sign is unrelated, but I couldn't resist. They are actually building a whole new services, in the meantime shops and toilets are housed in containers. The pool at the Melrose Arch hotel has extended beyond the standard swimming usage. This afternoon I am the only person here, I am told it is too windy. Oh, and there are clouds, too. Compared to windy Wellington this is the perfect climate. All over the hotel we find these coke can flowers, pretty. Limbo for a day as I fly from Wellington to Johannesburg via Sydney. That this is even possible. Used to be I got excited about flying home to Germany from the UK, now continent hopping becomes a frequent occurrence.